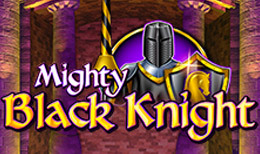 Mighty Black Knight by Barcrest is a 5 reel and 10 -100 payline slot. Players can play on up to 50 paylines depending on the stake they set during the main game. Game features include expanding wilds, a Free Spins feature, Mighty Reels feature, Big Bet Mode feature and more. There’s up to 40 free spins to be won so start your bets at 10p to £250 per spin on your desktop, mobile and tablet. Barcrest has a long history dating all the way back to 1968. The company was formed in the UK. At one point in time almost all the slots in pubs and casinos around the UK were Barcrest creations. The company enjoyed most of its success before the internet grew. Scientific Games bought the company in 2011. Barcrest have released some of the best slots out there. This slot has a medieval theme. Game symbols featuring on the reels include diamonds, spades, hearts and flowers. All of these are low value symbols. Other symbols which pay much higher values include; rings, maps, queens, crowns, orbs and kings. The king pays the highest value rewarding you 5x your bet when you land 5 on a payline. In terms of gameplay, the stake you place determines how often you win. For a stake under £2 per spin, the RTP % will be 94%. For that over £2 per spin, the RTP % is 96%. The Big Bet Mode feature will increase your RTP % to 98%. The amount you bet also determines the number of paylines you play on. Wild symbol- The Mighty Black Knight acts as the wild which substitutes all the other symbols except the scatter. If a 3-symbol high wild lands on the reels, the Mighty Reels feature will be activated. What follows is that the paylines double to 100. The wild then expands, fills the entire reel and can land on all 5 reels so it’s possible to get a screen full of wilds. Free Spins feature- It’s activated when 3 or more Bonus scatters land anywhere across the reels. 3, 4 or 5 scatters reward 8, 12 or 20 free spins. Keep an eye out for scatters during free spins as these can win you more free spins. You get a total of 40 free spins. Mighty Reels feature- You can activate this feature when you get an expanding wild land fully on the reels. The win lines double and the wild expands and takes over the entire reel. It’s possible to activate the Free Spins feature during the Big Bet mode. You will get 40 free spins and the Mighty Reels feature is activated frequently. Mighty Black Knight has the Barcrest mark- the Big Bet Mode feature. If you can, it’s highly advisable you use the Big Bet Mode feature as the rewards tend to be much bigger. Mighty Black Knight has a medium to high variance and offers with wins of 1,000x your bet on every spin/free spin.